Norwex Floor Systems clean floors using microfiber or polyester Mop Pads and water only. Superior Dry Mop Pads are constructed of Norwex Microfiber and use static electricity to draw and lift even the tiniest particles up into the cloth. Open spaces in the fibers created by the splitting process enable the pads to lift away dust and dirt and absorb several times their own weight in water. Norwex Microfiber in the Wet Mop Pad has the ability to remove up to 99% of bacteria from a surface when following the proper care and use instructions. The Wet Mop Pad contains Norwex’s exclusive BacLock™ agent. Telescopic Mop Handle also takes our bendable microfiber EnviroWand™ to clean ceiling fans. 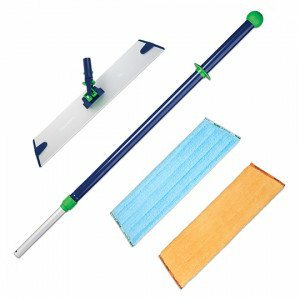 Dry Mop Pads can be cleaned quickly using the Rubber Brush. All Mop Pads also wash clean in the laundry with Ultra Power Plus.